Coconut Grove is, simply put, Miami's nicest neighborhood. Downtown has been plastered with one high-rise condominium after the other, and most of the old downtown neighborhoods full of 1920s Spanish-style homes, like Brickell, are a thing of the past. 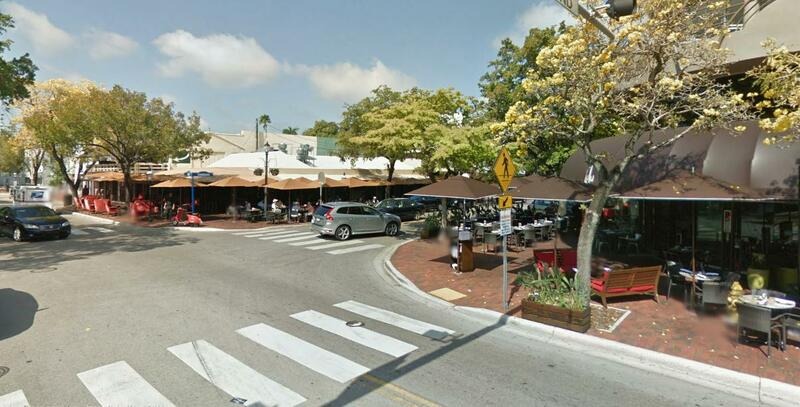 But Coconut Grove has survived by being a bit hidden away, far from the Miami Vice glamor, tucked away on the south side of town. 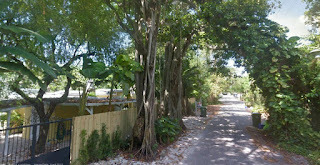 The northeast part of the Grove, close to the bay, has been flattened for condominiums, but most of the area is intact. 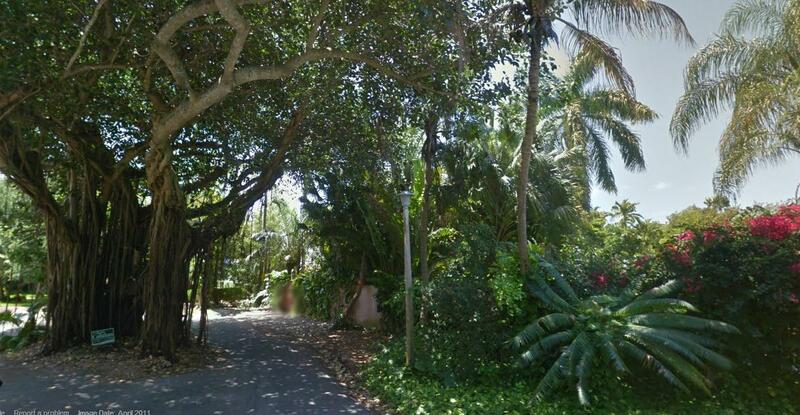 I grew up north of Miami, and so it took a while before I even saw Coconut Grove. But the first time I saw it, I was knocked out. It was so tropical, so lush. I was captivated, I was... IN LOVE. This was like all of Florida should have been. Once you have seen Coconut Grove, you can't understand why the rest of Florida's towns weren't built just like this one. Some of the Grove's houses are spectacular mansions, some are quite humble cottages. But the houses are fairly unimportant. 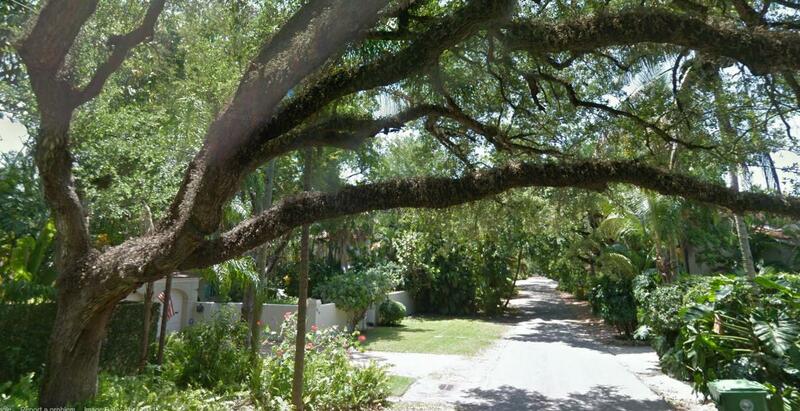 They just play the lowly part of supporting actors along these streets: the gardens are the real stars. 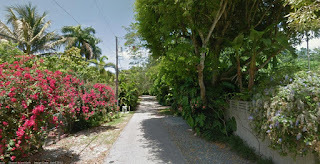 There are nice streets all over Coconut Grove, but the nicest section is in the south: bounded by Le Jeune Road on the west, Biscayne Bay on the east, Loquat Street on the north and Battersea Road on the south. You could just zig-zag up and down every narrow street in the area, and never tire of the tropical beauty. It doesn't really matter which streets you take: they're all great. So just interpret this route as being a sampling of what Coconut Grove has to offer. And, if you're lucky, you will have the honor of coming back again to run the other streets. Praise your good fate if you get to come back! 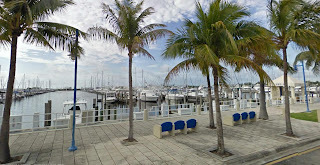 Any self-respecting Florida run has to have a good waterfront stretch, so we'll begin the route at the Miami City Hall, in front of the Dinner Key Marina. City Hall is a 1930s-era ex-sea-plane terminal. It looks like maybe it would be a well-stocked beach-supply store, NOT the administrative hub of America's richest city. NOT Pan-America's most important metropolis, full of zillions of gleaming high-rises and an international center of bustling finance. 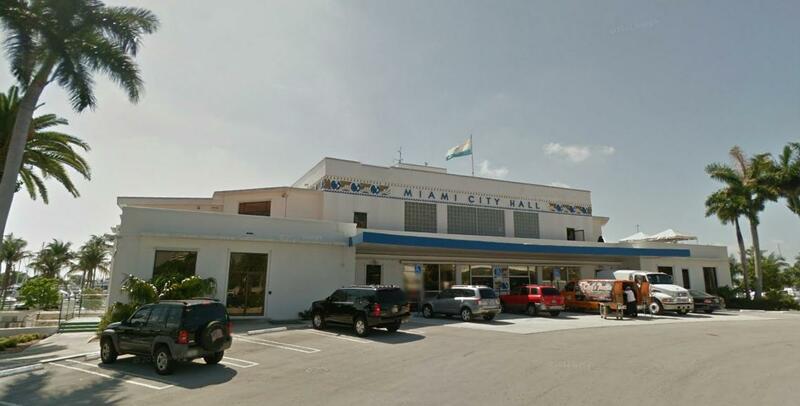 But a city hall it is, and that throwback converted-five-and-dime-store style gives it its charm. Looking at the front entrance, turn right and run southwest along the marina docks, with the water to your left side. I just love watching all the boats and could hang out here all day. Maybe I'll stay here: hey, meet me back here when you finish the run... See you later! 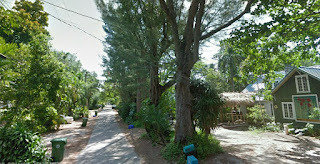 Now -- running alone and freed from hearing me complain about my right knee -- follow the shore as it turns northwest and then southwest again, past the Dinner Key Auditorium (ex flying-boat hanger), then going past the boat ramps, into Kenneth Meyers Park. As Bayshore Drive turns to the right, at the sailing club, and becomes McFarlane Road, turn with it. You are now heading northwest again. At the first intersection, where both Grand Avenue and Main Highway cross, turn left onto Main Highway. This corner is the main shopping area in the Grove. In 2 blocks, you'll cross Commodore Plaza, the nicest little downtown street in the Grove, with a variety of nice shops and outdoor restaurants. Keep heading south. Main Highway isn't as bad as its name would imply. The traffic is not normally very heavy, and the street is fairly scenic itself. On your left, you'll pass little cul de sac streets leading towards the bay. Some are private, gated communities, some are open. We'll try one, later in this route. Run down Main Highway until you pass the coral-rock wall around the Plymouth Congregational Church on the right side. 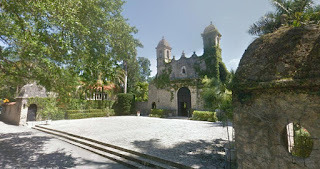 Turn right onto Devon Road, pass the beautiful stone church and follow the street as it curves under a banyan. 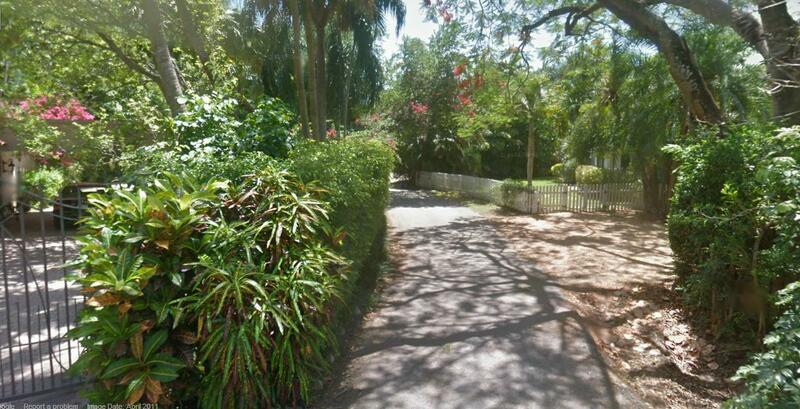 Devon ends at Hibiscus, where you turn right, then left after just one house. You are now heading west on Loquat, and you're suddenly in the REAL Grove, everything lush and tropical and close at hand. Paradise! Run the half-kilometer until Loquat ends. We want to keep going west for another block, so turn left on Solana, then turn right again after just one house, to run down Lybyer Ave. At the next corner, Justison Road, turn left and now we head south. After a few curves, the street name later changes to La Playa Boulevard, but just keep running south. Just after you cross Malaga, the street goes around a banyan sitting in the middle of the way. Hey, share the road! La Playa ends when it hits Kiaora Ave. Turn left and follow Kiaora as it turns to the right and changes its name to Braganza Ave. In three blocks, at Hardie Street, Braganza ends, where you turn left and then right again at the next corner, Lennox Drive. Lennox is interesting because it has a little island in the street for one house. Lennox ends at Ingraham Highway, a bit more trafficked than most streets around here. Cross Ingraham and run into Stewart Avenue, leading diagonally off to the east. Stewart ends at Douglas Road, where we turn north to head back on the second half of the trip. Run three blocks to Park Lane, where you turn right. This little side-trip will take us to the water, to get a view of Biscayne Bay from this end of Coconut Grove. There's just a small spot to look out at the bay. Then head back to Douglas Road on North Bay Homes Drive. Douglas Road is a bit loud, so we'll get off onto quieter streets as soon as we can. Run 200 meters north on Douglas, then turn left onto El Prado Boulevard. This is a very cool neighborhood, with a few little cul de sacs and house-islands in the street. At Utopia Court, turn left to run around one of the islands, then continue west on El Prado. In one block, El Prado crosses Braganza. Turn right (north) on Brazanza and run three short blocks to Poinciana. Turn right on Poinciana and run east to Main Highway. Turn left here and now follow the same way back to the City Hall as you came, and pick me up at the marina. Beautiful run, huh? And did you see that Bristol Channel Cutter down the dock?